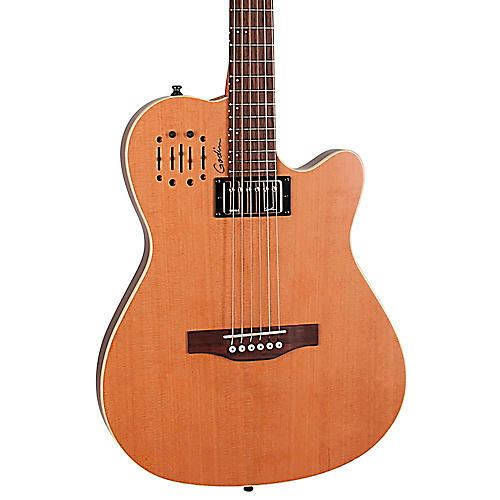 The Godin A6 Ultra Semi-Acousti-Electric guitar offers the innovative concepts found in all Godin A-series guitars. You get plugged-in acoustic sound with the feel of an electric guitar neck, along with a chambered body that virtually eliminates feedback in live and loud settings. The Godin A6 Ultra guitar adds "oomph" and full tone with a Godin humbucker pickup in the neck position. Other enhancements include an under-saddle transducer, dual outputs (acoustic and electric) that combine for huge stereo sound and a Custom Godin preamp voiced specifically for the A6 Ultra. The preamp gives guitarists control of their tone via sliders for acoustic volume, treble, mid, bass and independent controls for the electric humbucker volume, treble and bass. Whether plugging into the single acoustic mix or in stereo (via both outputs), controlling your tone is at the tip of your fingers. And the Godin A6 Ultra guitar delivers in all styles of music from jazz to rock to country, as well as being a great blues slide guitar. Other appointments on the Godin A6 Ultra guitar include a solid cedar top, a 2-chambered silver leaf maple body, semi-gloss mahogany neck with Richlite fingerboard, and the comfortable feel of an ergocut back.